So my boyfriend and I recently ventured into one of Australia’s most popular tourist cities, Melbourne, also known as Sydney’s artsy-fartsy, hippie cousin. Though having lived in Australia as a citizen for about eight years and counting, I never got the chance to fly off to Melbourne until this year. We were both inspired by the exciting tales of a dynamic city life; complete with buskers at every corner, an absence of nightlife lockout laws, hipster cafes and eye-candy graffiti adorning the streets – and let me tell you, our actual visit ceased to disappoint. Head on over to Degraves Street. A constantly buzzing laneway lined up with eateries of various cuisines and stylish interiors, this hot-spot is sure to satisfy your inner hipster foodie. Join in on the bustling crowd as you explore little hole-in-the-wall cafes, Italian-style restaurants with alfresco dining, and boutique shops that sell a wide range of eccentricities from quirky dresses and jewellery to artisan notebooks. If you need help on where to start (with all the options laid before you, it can get a bit overwhelming!) – the Degraves Espresso Bar is known for delivering a ‘quintessential Melbourne café experience’, with its café umbrellas bringing about a classy, Parisian feel. Oh ho ho, this one’s my favorite category to talk about. 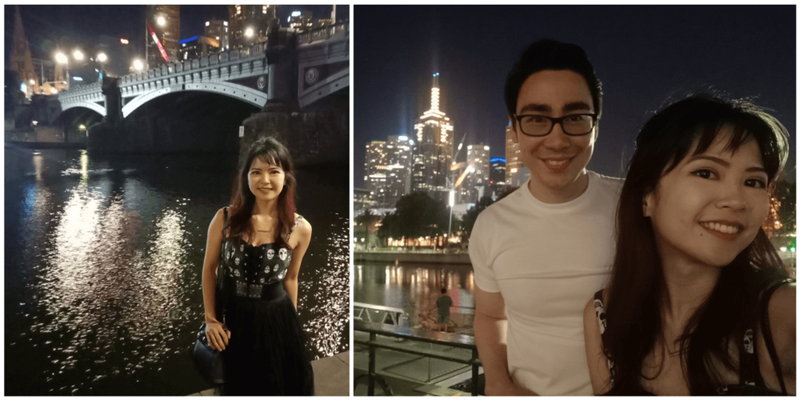 Having heard that Melbourne’s laws don’t impose a bar ‘lockout’ at a certain time of the night, we decided that we were definitely going to make the most of the bar scene and get in on all the millennial festivities once the sun goes down. If you’re a fan of all things Disney and fantasy, this bar will have you in a daze (as it did with me). Situated in a somewhat secluded alleyway, Storyville’s a veiled hotspot that’ll delight the fairy-tale lover in all of us. At the entrance, you’ll be greeted with a large mural of a short story and windows laced with dead tree branches. The staircase leading up to the bar is designed with a Snow White-woodland feel, with signs that lead to “Narnia” and whatever other fairytale reference. Once inside, you’ll find that the main bar is like something out of Alice in Wonderland, with giant, vibrantly-coloured mushrooms looming over the tables. The bar sticks true to its theme with menus in the style of storybooks and cocktails named after famous fantasy films or novels. But wait – there’s more! Head on over the upper floor and you’ll find a large ping-pong table with a mural of some of the world’s most beloved fairytale books. The walls are made of brick and adorned with flora, giving you the sense of living it up in some princess’ tower. If you’re looking for a bar with a more urban, industrial feel, make sure you visit one of Melbourne’s most infamous: The Croft Institute. The experience you’ll gain out of looking for the Croft Institute is almost as fun as being in the bar itself, as it’s located in a pretty desolate, shady alleyway lined with the backdoors of restaurants and overlaying graffiti art. Once you zig-zag your way through these lonely corners, you’ll find a glaring sign at the end of the walkway displaying the name of venue. Step inside and you’ll discover that the environment is loosely themed after an abandoned science lab. While the drinks aren’t placed in fancy glasses or served with peculiar effects like in Storyville, what adds quirkiness to these cocktails are the medicinal syringes they serve them with. Plus, they’ve got a glass case of vials, beakers, and test tubes, giving off even more of a deserted, eerie lab vibe. For a fantastic view of the city over drinks and fast bites, take your pick out of one of the bars and restaurants lining up the Yarra River. While it’s just as pretty to look at during the daylight, I recommend heading over at night just to catch the nightlife buzz and the Grand Canal-esque, moonlit view of the river. For snacks and drinks smack-dab in the middle of the water, head on over to Ponyfish Island – which, true to its name, is like a little island keeping a busy bar afloat. You’ll get a perfect view of the Yarra as you converse over cocktails and nachos. A luxury view at Ponyfish Island. If you’re a tad hungrier, try out the Arbory Bar and Eatery, where they serve fantastic chicken wings and American hot dogs. You’ll still have a nice view overlooking the waters while tucking into some dinner. Hands down – this was one of the most memorable bar experiences I’ve had to date, although it may have to do with us being at the right spot in the bar, at the right time. Berlin is, as you’ve guessed, embellished with plenty of German themes and motifs, and divided into two sections: the Capitalist side (aka “The Salon”), and the Communist side (aka “The Bunker”). Join in on the ‘capitalists’ and you’ll get the extravagance of VIP booths and luxury decorations; join in on the ‘communists’ and you’ll be treated to a dark room with portraits of Joseph Stalin and an old, black-and-white German film projected onto one of the walls. Of course, we went with the ‘capitalist’ section of the bar, and were treated to a lovely, secluded VIP seating overlooking the rest of the scene. The menus have ‘maps’ that assist you with picking the perfect drink to suit your taste buds – but all of this didn’t compare to the entertainment we experienced moments after settling in. If you’re lucky enough, you’ll get a visit from a man named Mr. Marmalade – a quirky-looking dude with a picture-perfect handlebar moustache and a peculiar briefcase. I won’t spoil anything, but if you spot this guy, definitely welcome him aboard – he’s got a few tricks to surely make your night worth it. Last but not least, I highly recommend the bar known as Madame Brussels – a cutesy, delightful little garden party-themed lounge with a rooftop overlooking the city. The place has a very classy European-like feel to it, but here’s the plot twist: it used to be a brothel. That’s right, despite its tea-party looks, this posh bar used be one of the most successful brothels on Melbourne’s Lonsdale street. The cocktail menu has its fair share of sexual innuendos, with most that are perfect for sharing. The beau and I had a jug of “Death in Venice” shared between us, and if you’re after something fruity, I recommend asking the waiter for this one. Oh, and extra stars for this venue’s fine table service! We were seated in the outer rooftop area, and with the fancy English furniture and garden aesthetic, we had a very elegant, romantic drink under the stars. For those of your friends who have visited Melbs, I’m willing to bet that almost all – if not all of them – have shared photos of themselves posing it up in Hosier Lane. One of the most famous walkways you’ll find in the city, Hosier boasts an array of fascinating street art and detailed murals that’ll have you stop to take a picture with every step. From zany illustrations to pop culture references, you’re going to want to visit this street to complete your Melbourne experience. Plus, there are a few “hidden” cafes and restos to pop into along the walls! If you’re into boutique stores, vegan eateries, and even more cafes, take a stroll down Brunswick street for a different, less metropolitan feel of Melbourne – but with culture and artsy-fartsiness still lining up the streets. Must-see places absolutely include the famous tourist spot, IceBar – where you’re dressed in full-on winter gear as you enter a bar completely clad in ice, from the walls, to the chairs, to the bar itself. Don’t miss a photo opp with some of the fantasy-themed sculptures and the Ice King mural that greets visitors at the side of its street. Sadly, I’m only speaking from the photos and reviews I’ve seen of this exciting place, as my boyfriend and I didn’t actually have the time to go in (*sniff*). 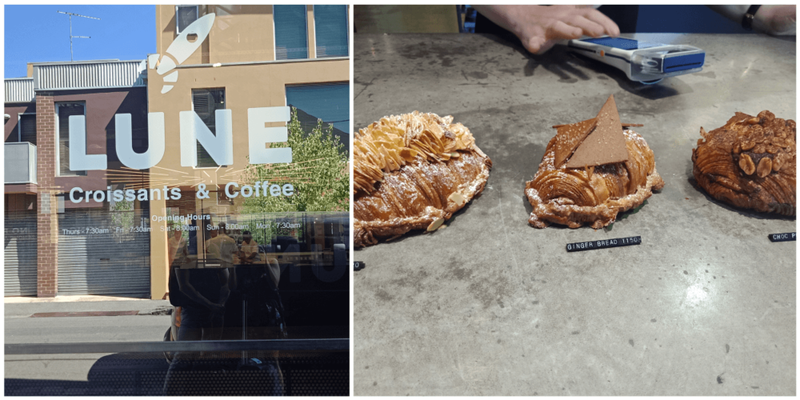 If you’re hungry, be sure to pop into Lune Croissanterie for a visit, where you’ll literally have what are considered the ‘best croissants in the world’. And sure enough, these tasty treats are going to ruin all other croissants for you. Don’t miss out on these (and be sure to take some out if you can); you’ll also get a chance to watch the bakers at work as they encase the pastry-making process in a glass division right in the centre of the café. For all you film and TV nerds out there, I highly recommend popping into ACMI for an in-depth look at how directors and filmmakers go about their cinematic processes, as well as how some of the most successful video games and animations came to fruition. It’s chock-full of interactive stuff that’ll have you going “Oh, so that’s how they do it!” more than a few times. If you’re looking for an artsier attraction, visit the NGV that’s just next door. Sadly, this was another on our list that we weren’t able to visit, though online pictures have shown that they display a wide range of artistic works, from sculptures to traditional paintings to contemporary installations. Definitely worth satisfying your inner art junkie and snapping a couple of Instagram shots. For a bit of a break after a long day of walking, you can also kick back and relax in the middle of the square, either on the steps or the large patches of fake grass. It’s a great place to watch the sunset, take a bunch of selfies or simply watch a few dogs run and play. Finally, we’ve got the Old Melbourne Gaol (which is actually pronounced ‘jail’, for anyone who was as ignorant as I was and persistently said it as ‘gah-owl’ to the locals), a large prison-turned-museum that held some of the state’s most dangerous criminal masterminds. Dive into a totally immersive Shawshank experience as you get to enter the former cells of these very same criminals (complete with a clay model of their actual face) and the disturbing trials they faced for their actions. You’ll also learn more about Ned Kelly, one of Australia’s most infamous outlaws, who was also imprisoned in the establishment. At a certain time in the day, be sure to take part in the Gaol’s guided tour at the City Watch House, where a former warden simulates your ‘arrest’, giving you an up-close-and-personal experience of what it’s like to live as a prisoner in one of the cells. Plus, you get a mug shot at the end as a souvenir. Bonus points for the tower’s cells preserving their original, rundown appearances – as grotesque as it was, it was fascinating to see the untouched claw marks, dried blood, and vandalism surrounding the walls. Truly made you imagine what it would’ve been like from their shoes. St Kilda it is! About a 20-30 minute commute from the city (less if you drive or take an Uber) St Kilda is Melbourne’s most famous beach; 700 metres long, with a pier that’s visited by penguins at sundown. That’s right, these little guys are actually a tourist attraction themselves, so be sure to get there before the crowd gathers at dusk to get a good view of these cute critters. There’s also a boardwalk heading to and from the pier that’s perfect for a romantic sunset walk, or if you’re looking for a scenic place to fish. Of course, for those after water activities and a more summery, sun-bathing experience – the wide, clean beach offers just this with plenty of opportunity for paddle boarding and wind, kite, and water-surfing. On Sundays, enjoy all the original artworks, food, and knick-knacks that the St Kilda Esplanade markets has to offer; featuring a long strip of stalls where passionate individuals and craftspeople sell their one-of-a-kind, homemade products. There’s tons to see, and apparently new stalls are even added on a regular basis! Situated next to the markets is of course one of Melbourne’s greatest attractions: Luna Park. While you don’t necessarily have to enter the park to fulfil your trip (though the entrance fee is only $5), you might want to snap a photo outside of the establishment’s iconic, eerie face – unlike Sydney’s, it seems like Melbourne has tried preserving its original appearance from 1912 as much as possible. And there you have it – some of my most highly recommended places to visit if you ever find yourself in Melbourne. Like I said, it’s a city brimming with life and artistic charms at every turn, and you’d want to absorb much of these sights to make the most of your stay. Though the boyfriend and I stayed for three nights and four days, it still wasn’t enough to fully experience everything the place had to offer; so if you can, be sure to lay down enough time to truly immerse yourself in the life of a Melbournian. As a side note, it was absolutely lovely to see people so proud of their city. Almost every person we talked to had only positives to say, lighting up with excitement as they recommended all the hot spots we ought to visit. When they say “Welcome to the best city in Australia!”, you can tell they truly mean it, which was truly refreshing to see.